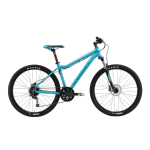 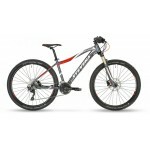 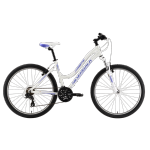 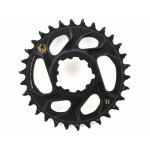  Mountain XC Travel 100mm Weight 13.22kg The Splash 275 mountain bike range is designed for the lady who wants the performance benefits of larger wheels. 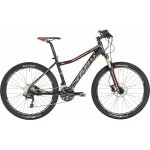 The agile 275 wheel size works perfectly for the female rider to inspire confidence in off-road riding. 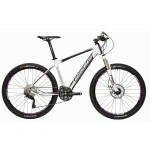 The ladies specific geometry and lightweight alloy frames provide a superb platform for recreational cycling. 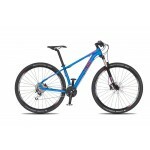 FORK: Suntour XCR Air LO-R, 100mm Travel, 1-1/8” Allo..
Mountain XC Travel 100mm Weight 14kg The Splash 275 mountain bike range is designed for the lady who wants the performance benefits of larger wheels. 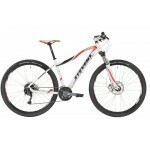 The agile 275 wheel size works perfectly for the female rider to inspire confidence in off-road riding. The ladies specific geometry and lightweight alloy frames provide a superb platform for recreational cycling. 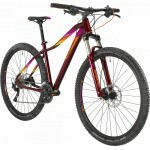 FRAME: 27.5” 6061 Aluminium, Women’s Specific Butted fra..
Mountain XC Travel 80mm Weight 13.54kg The Splash 26 is a great bicycle for the recreational female rider and features a step-through top tube for great standover clearance and ease of use. 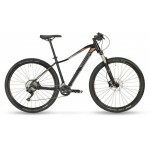 The ladies specific geometry and lightweight alloy frames provide a superb platform for recreational cycling. 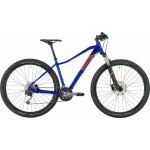 FRAME: 6061 Butted Aluminium, Step-Thru Toptube, 135mm QR Dropouts, disc brake mounts, fender mounts ..
Mountain XC Travel 100mm Weight 12.03kg Using our knowledge of 279 wheel technology, a Ladies specific cross country machine was born. The 29er front wheel mixed with an 80mm front suspension fork keeps the front end low, the 29er front wheel enhances rolling efficiency, rider comfort and cornering traction, while the 27.5 rear inch wheel makes it easier to control and position one’s weight over the rear of the bike during techni..
Mountain XC Travel 100mm Weight 14.85kg The Splash 275 mountain bike range is designed for the lady who wants the performance benefits of larger wheels. 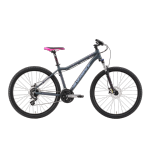 The agile 275 wheel size works perfectly for the female rider to inspire confidence in off-road riding. 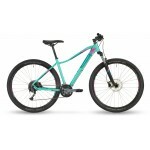 The ladies specific geometry and lightweight alloy frames provide a superb platform for recreational cycling. 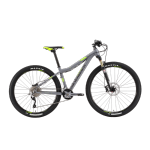 FRAME: 27.5” 6061 Aluminium, Women’s Specific Butted ..
RámAluminium 6061 DBPřední vidlice SR Suntour Raidon XC-RL-R AirHlavové složení STEVENS MTB Taper 1 1/8" - 1 1/2"Brzdy Shimano BR-M395Kliky Shimano FC-M622Přesmykač Shimano DeoreŘetěz Shimano CN-HG54MěničShimano SLX Shadow+Kazeta Shimano CS-HG50Pedály MTB Alu FlatpedalPřevody 1.34 - 7.96 m, 3*10 (27.5")NábojeShimano HB-M3050 | FH-M3050Ráfky Oxygen COMP-D X19PláštěSchwalbe Racing Ralph PerformanceŘidítka Oxygen DriverPředstavec Oxygen DriverSedlo Oxygen DamselSedlovka Oxygen DriverŘazení Shima..
Rám Aluminium 6061 TBPřední vidlice SR Suntour Raidon XC RL-R AirHlavové složení STEVENS MTB Taper 1 1/8"-1 1/2"Brzdy Shimano BR-M395Kliky Shimano FC-MT500Přesmykač Shimano DeoreŘetěz Shimano CN-HG54Přehazovačka Shimano Deore XT ShadowKazeta Shimano CS-HG50Pedály MTB Alu FlatpedalGear ratio 1.34 - 7.96 m, 3*10 (27.5")Gear ratio 1.41 - 8.40 m, 3*10 (29")Náboje Shimano HB-M3050 | FH-M3050Ráfky Oxygen COMP-D X19Pneumatiky Schwalbe Racing Ralph PerformanceŘidítka Oxygen DriverPředstavec Oxyge..
Rám Aluminium 6061 DBPřední vidlice SR Suntour XCR32 LO-RHlavové složení STEVENS MTB 1 1/8"Brzdy Shimano BR-M315Kliky Shimano FC-M3000Přesmykač Shimano FD-M2000-TSM6Řetěz Shimano CN-HG53Přehazovačka Shimano Deore ShadowKazeta Shimano CS-HG201Pedály MTB FlatpedalGear ratio 1.40 - 8.68 m, 3*9 (27.5")Gear ratio 1.48 - 9.16 m, 3*9 (29")Náboje Shimano HB-TX505 | FH-TX505Ráfky Oxygen COMP-D X19Pneumatiky Schwalbe Smart Sam Active-LineŘidítka Oxygen DriverPředstavec Oxygen DriverSedlo Oxygen Dam..
Chassis Frame Aluminium 6061 DB Axle: QR10x135 Brake: IS disc BB: BSA 73 mm Front derailleur mount: clamp Cable routing: external Rack mounts Přední vidlice SR Suntour XCM HLO Travel: 100 mm Coil spring Lockout Steerer 1 1/8" Axle: QR9x100 Brake: postmount disc 6" ..
Chassis Frame Aluminium 6061 TB Axle: QR10x135 Brake: IS disc BB: BSA 73 mm Front derailleur mount: clamp Cable routing: internal (shifting)/external (brake) Rack mounts Přední vidlice SR Suntour Raidon XC RL-R Air Travel: 100 mm Air suspension Remote Lockout Tapered Steerer 1 1/8" - 1 1/2" Axle: QR9x100 Brake: postmount disc 6" Hlavové složení STEVENS MTB Taper 1 1/8"-1 1/2" Upper bearing cup: ZS44/28.6 Lower bearing cup: ..
Chassis Frame Aluminium 6061 DB Axle: QR10x135 Brake: IS disc BB: BSA 73 mm Front derailleur mount: clamp Cable routing: external Rack mounts Přední vidlice SR Suntour XCR32 LO-R Travel: 100 mm Coil spring Lockout Steerer 1 1/8" Axle: QR9x100 Brake: postmount disc 6" ..
RámAlu 6061 DBVidliceSR Suntour XCM HLO-DS, 100mmPřehazovačkaShimano Alivio Shadow RD-M4000-SGSPřesmykačShimano Acera FD-M3000-TSM6ŘazeníShimano SL-M390BrzdyTektro Auriga, 180/160mmKlikyShimano Acera FC-M3000, 40-30-22KazetaShimano CS-HG200, 11-34T, 9-speedŘetězShimano CN-HG53Zapletená kolaWTB SX 19, 19CPláštěSchwalbe Smart Sam 2.1"SedloOxygen DamselSedlovkaOxygen PistolPředstavecOxygen Pistol 31.8mm, 6°ŘídítkaOxygen Pistol Rise 12mm, 9°, 700mmHmotnost14.7 kgHlavové složeníSTEVENS MTB 1 1/8”, ZS..
KazetaShimano CS-HG62-10, 11-34Hlavové složeníStevens MTB AL Integrated 1 1/8"VidliceSR Suntour Raidon X1 RL Air, 100mm, remote lockoutSedlovkaOxygen Driver 380mmSedloOxygen DamselŘídítkaOxygen Driver Rise 30mm, 630mmŘetězShimano CN-HG54BrzdyAvid Elixir 1 180/160mmŘazeníShimano Deore SL-M591RámAluminium 7005DB superlite t-wallPřesmykačShimano Deore FD-M591PřehazovačkaShimano SLX RD-M670PředstavecOxygen Driver 25.4mmPláštěContinental X-King 26x2.2"KolaRyde TaurusKlikyShimano FC-M552-10, 42-32-24..